I was paired with Jessica @ Practically Vegan, a vegan blogger from Atlanta who like me loves Asian food. I was really glad to be paired with a blog that is quite a bit different to mine and I’m looking forward to expanding my vegan knowledge. I have a few vegan friends and always want to know how I can cook for them. 1. Where are you based Jessica? Is it a good location for foodies? I am based in Atlanta. I believe it is a good location for foodies because there are a bunch of great farmers markets (at least 5 permanent ones and then seasonal ones). It’s very easy to get natural and fresh ingredients as well as a wide range of ethnic foods which are all great for vegan recipes. 2. How long have you been blogging and why did you decide to set up a food blog? I’ve only been blogging for a few months and not as regular as I would like. Hence my mentor is trying to help me set aside more time for blogging. I started a blog one year after I became a vegan. I wanted to show the world that making the transition really isn’t hard and doesn’t require a lot of extra money in your grocery bill or time in the kitchen (unless you want to as there are some really fun vegan recipes that are worth the extra time). I wish I had had someone who could have shown me earlier just how easy it was and I’m hoping I can be that last little boost for people looking to become vegan. So the name fits. Practically vegan for people who are almost there, and practically vegan for methods that are more down to earth. 3. What kind of cooking do you enjoy? Do you eat differently when you go out for a meal? I am very much into Japanese food and I love trying new recipes from traditional Asian cookbooks. If the book isn’t vegan I modify it which is always fun. When I go out to eat I have to be careful that my food does not contain hidden animal ingredients. But the longer you are vegan the easier it gets. I still very much enjoy Asian food when I go out such as Thai, Malaysian, Chinese, Japanese, Vietnamese, or Indian food is always good. 4. Where do you find inspiration for the dishes you create? I love to find recipes that are not vegan from various cookbooks or websites and then modify them to be vegan. I also find recipes from other vegan blogs but my main source is my ridiculous cookbook collection. You can never have too many!!! 5. 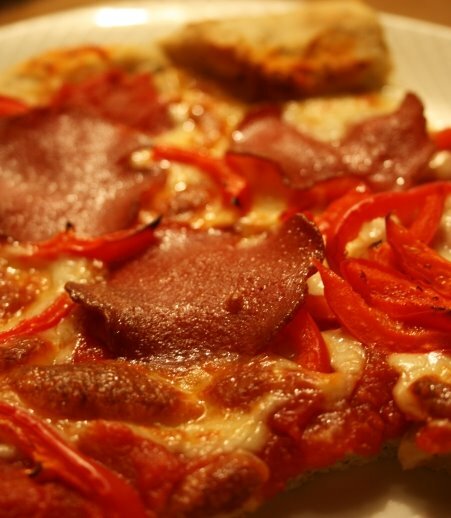 Can you tell us about four of your most creative or successful dishes that you have blogged? One of my favorite recipes of all time is spicy tempeh suchi rolls. Its so easy and I usually eat it once a week. I just can’t get enough of it and its such a filling meal. 6. Would you blog about a dish that has gone disastrously wrong? Oh sure I think the blogs should be real. I’m not perfect, neither is the food I make. Its about the trials and tribulations of being a vegan. I think when readers know that your not Ms. Chef of the year they can relate to you more. 7. What do you think are important ingredients of a good blog? Well first thing is first you have to keep writing. (which is my problem at the moment, not due to lack of subject matter but lack of time). Variety is important, you don’t want to bore your readers. Humor is always good to keep it light hearted. And the main thing I think is originality. So many blogs are just regurgitated information from other blogs. Talk about what you know best from your point of view. That is what makes things original. There is something really beautiful about beetroots. Their colour is out of this world…and they also have the ability to make a right mess of the kitchen. Hubby went a bit mad when buying beets for the beetroot brownies so I had quite a few left over. I wanted to make a hot dish with only a few ingredients. 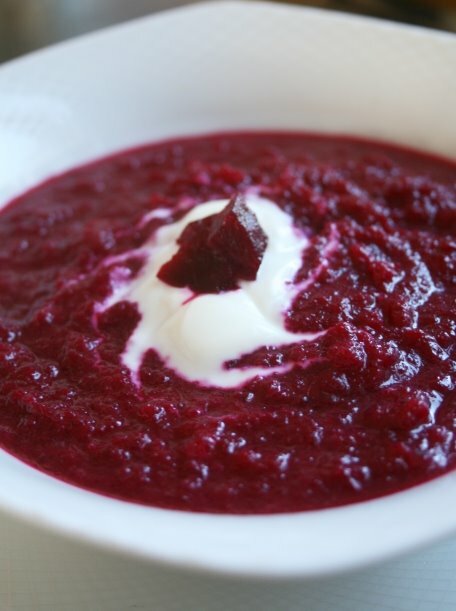 After a bit of searching online I settled on a beetroot soup. Hubby is obsessed with beetroot. As a child he was known to eat a whole jar of picked beetroot, which in turn caused concern to his poor mum when he started peeing purple…anyway that’s another story. Today he reveled in his beetroot themed lunch of beetroot soup and beetroot brownies. Bless him. I promise this will be the last of the beetroot recipes for a while! 1)In a deep pan cook the onions in the butter until softened. Stir in the diced beetroot. This week is National Baking Week and to celebrate I decided to make brownies, very special brownies with a intriguing ingredient. My love of baking is well documented. I enjoy it because it is stress-relieving, creative, rewarding, fun and I believe a home-baked good is always better than shop bought. Hugh is officially a god. 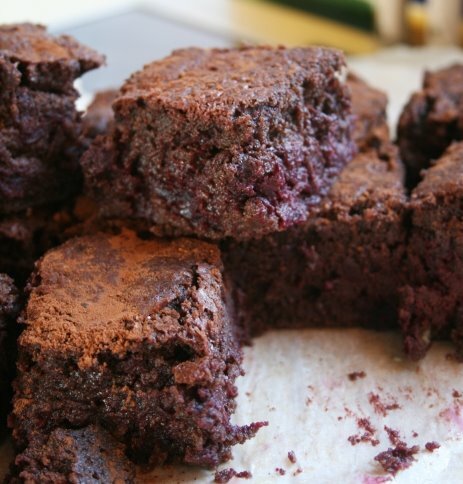 If he can turn a humble beetroot into a glorious, moist, rich chocolate brownie he’s a god in my eyes. Hey you know what I’m like, I’m always drawn to pink food like a magpie to anything shiny, and if it is pink and glittery…well I’m hooked. The taste was nothing like I expected. You can certainly taste the beetroot, but rather than it being an earthy taste its paring with dark chocolate turns it into a deep sweet taste, not unlike cherries. This has helped conquer my belief of vegetables not belonging in cakes. This recipe was featured on River Cottage Autumn last week and has caused a bit of a stir on foodie forums. One thing I did find was that I had to bake it for quite a bit longer than the original recipe, but this is probably because I used a different sized pan. 1) Preheat oven to 180oc. Line an 8×8 In a bain-marie (or using the oven method Hugh uses in the above link) gently melt together the chocolate and butter. Allow to cool for a few minutes. 2)Whisk together the sugar and butter then beat in the chocolate/butter mix. 3)Fold in the flour then beetroot. Pour into the tin and bake for 20-30 or until a skewer come out just about clean. Allow to cool in tin before slicing as it will continue to cook until cooled. The advantage of living where we live is that there can be an abundance of wild food and many people prepared to tell you their wild food haunts. Since tasting my Father-in-Law’s sloe gin at Christmas last year I was determined that this year we would make our own. Well the weather put a stop on that plan as the sloe harvest is really poor this year so had to settle on some other fruits we could forage. Inspired by Hugh F-W, Hubby set out Ray Mears style to forage for free food. Although there was no sloes he did manage to find the last of the blackberries and a tree heaving in haw berries. Added to the 5kg of apples from Aunt’s tree we had a plethora of free food to work with. A few months back we picked up a copy of River Cottage Handbook: Preserves and today it certainly came into its own! First to be made was Haw Ketchup. 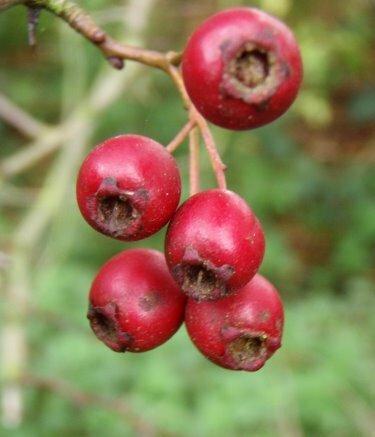 Haws eaten raw are incredibly sour (Hubby can vouch for that!) and you wouldn’t expect them to be edible, but with a bit of cooking they can be made into a lovely fruity sour sauce that will be perfect with game. I’m looking forward to trying this with a dish in a couple of weeks. 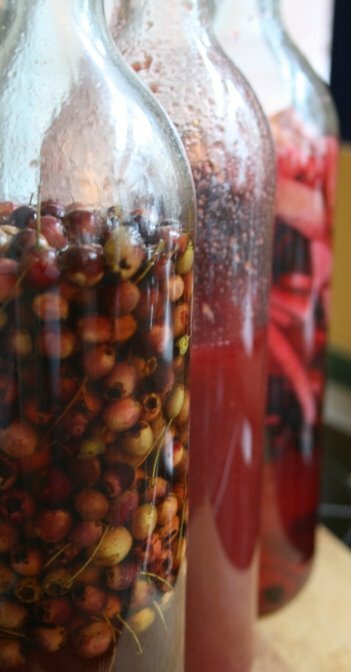 1) Simmer the haws in the vinegar and water for around 30 min until the berries are soft. 2) Pass through a sieve to rid of stones and skins. 3) Return the juice to a clean pan, stir in sugar and gently boil for 5 minutes. Pour into a sterilised bottle. Keeps for 12 months. Next was the turn of flavouring some alcohols. If we weren’t going to have sloe gin for this Christmas we could at least have blackberry & apple gin plus some haw brandy. The method for both of these flavoured alcohols is the same, all your doing is changing the ingredients. The longer you leave them to steep the better. Ideally they say you should leave them for a minimum of 8-10 weeks. The tasting at Christmas will tell us if they are really any good. 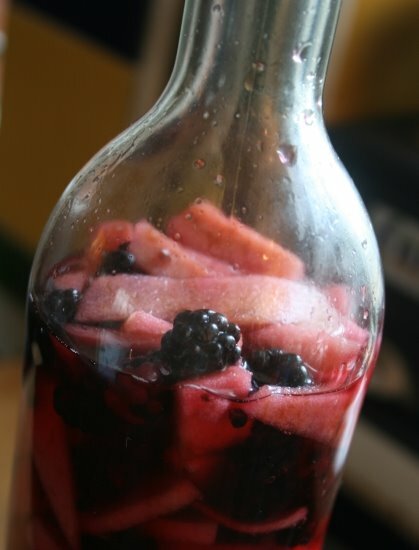 1) Pour alcohol into bottle, followed by fruit then sugar. Give it a good shake until all ingredients are well mixed. 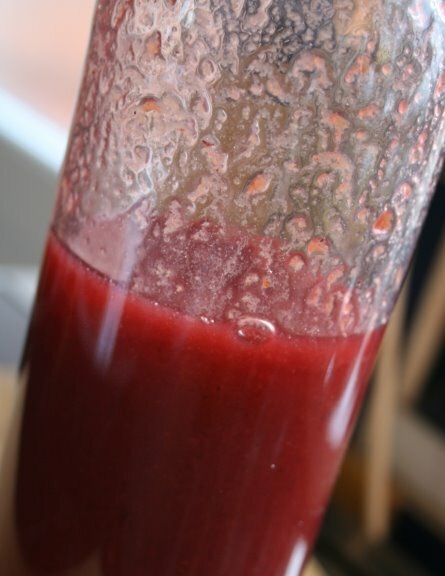 2) For the first week shake the bottle to stop the sugar settling to the bottom. After that shake on a weekly basis and taste after 8 weeks. Once it is ready for drinking filter through some kitchen paper/coffee filter. Enjoy! Poor Hubby, with a fridgeful of veg and lots of recipes I wanted to try I’ve inflicted a plethora of veggie dishes on him. First vegetable pie then next bean chilli. The familiar smell of chilli greeted him as he came from the front door and you could see his face literally drop when he noticed it was missing his favourite ingredient, meat. Without the soured cream it’s vegan. Although it is a veggie dish the beans help to make it meaty (according to Hubby) I’ve promised him some proper meaty dishes for the rest of the week! 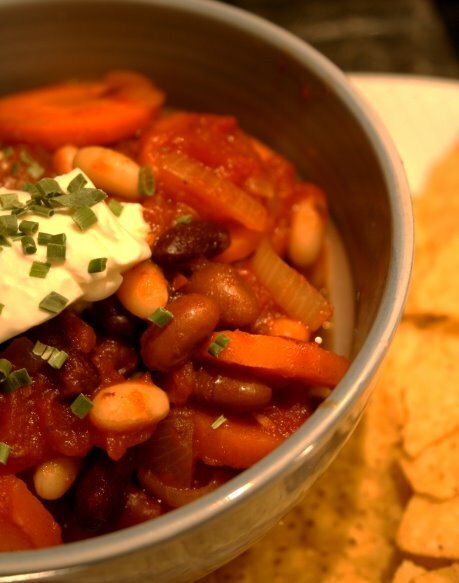 The recipe is cross between my chilli con carne recipe and a bean casserole recipe given to me by the lovely Fi on a foodie forum. 1) Fry onions for until they are beginning to soften in a small amount of olive oil, then add the garlic and carrots. Continue to cook for 3 minutes. 2) Add the wine and reduce for a few minutes. Add stock, spices, chilli. Simmer for 35 min, or until sauce has thickened. Add all the beans and seasoning. Simmer for a further 8 minutes. Parkin has been on “must bake” list for a while and when Sylvie @ A Pot of Tea and a Biscuit made some for British Food Fortnight I decided I had to give it a go. Parkin is from Yorkshire and traditionally eaten on Bonfire Night. The principle ingredients of parkin are flour, oatmeal, fat (traditionally lard), black treacle and ginger. 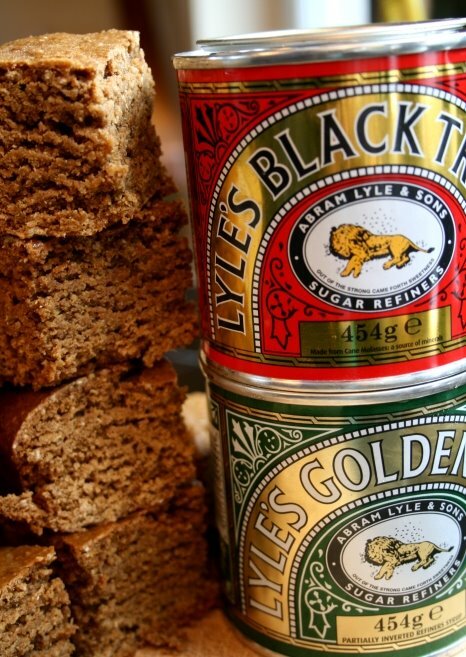 Lyle syrups are archetypal ingredients in British baking and the tins are kitchen icons. Black treacle reminds me of cooking Christmas cake with my mum. There was always a fight as to who would lick the spoon clean. As a child I was always intrigued by the lion logo on the tin. Innocent little me thought it was a sleeping lion with stars above it; in reality it is a dead lion with a swarm of bees. No I don’t get it either, though wikipedia does go some way to explain it. I perfer to think it is still a lion happily dreaming away! Black treacle has the ability to be explosive (hence why it tells you on the tin not to open it after best before date and dispose of it). Maybe this is why it appears in so many dishes associated with bonfire night! I think I may have slightly overcooked it, but with a few days of rest it should begin to go stickier. I was also expecting it to come out a bit darker in colour so next time may use soft dark sugar instead of golden caster sugar. Saying that, it still takes very good! 1) Preheat oven to 150°C/Gas 2/300°F and line a 10×10 baking pan. Gently heat the butter, golden syrup, treacle and sugar in a pan, stirring constantly until all the sugar is dissolved. 2) In a bowl sift together flour, oatmeal, baking soda, salt (if using), ginger and cinnamon. Make a well in the centre and pour in the melted butter mixture, beat until everything is combined. 3) When combined add the egg and mix until you have a smooth soft batter. If the batter seems to be stiff add 1tbsp of milk. The manic week from hell is over. The dreaded Ofsted paid us a visit. Thankfully the weather and kids behaved themselves (ask any teacher and they’ll tell you kids go loopy when it’s windy) and we did well. The Head, governors and LA thanked us today by treating us staff to a tonne of cream cakes, chocolate & what seemed to be the worlds biggest fruit bowl. By the end of the day a huge dent had been made in the cream cakes (well they did HAVE to be eaten!) and the fruit…well it can wait another day. After a few months of feeling really uncertain in my job my boss has given me an offer I can’t refuse. My science background and quite frankly, food-geekyness has impressed her so much she’s asked if I’ll help lead the Healthy Schools initiative. Healthy Schools is all about promoting the health and well-being of its pupils and staff through healthy lifestyle choices. I have a little troupe of 9-11 year old grow-your-own wannabes and after half term will be launching a parents & child cookery club, Jamie O eat your heart out. We’ll ignore the cream cakes and chocolate in the staffroom, they are a well earned treat! Tonight I wanted a quick and easy tea, plus we had quite a bit of stuff needing to be used up. I’m also thinking about making pizza in one of the first cookery classes. Initially it wasn’t meant to be stuffed crust, but Hubby rolled the dough out a bit too big and it wouldn’t fit on the baking tray so folded the edges over on top of some of the cheese. Well if Pizza Hut…sorry Pasta Hut can stuff their crusts, so can I. 1) Mix together flour, salt, herbs and fast-action yeast (if using). 3) Knead dough on a floured surface for 10 min. If using a mixer, use dough hook and knead for 2 min. Place in a lightly oiled bowl, cover and leave to prove in a warm, draft-less place for 2 hours (or until dough has doubled in size). 4) In a small saucepan simmer all of the sauce ingredients for 10-15 min until you have a thick sauce. 5) Preheat oven and the biggest baking tray you can find to 250oc (or the hottest your oven will go). Roll out the dough and place on the hot baking tray. Place a row of cheese about an inch in from the edge of the dough. Fold the dough over the cheese. 6)Spread the sauce evenly over the dough base then sprinkle over the cheese and any other topping you want. Drizzle with olive oil. Bake for 8-10, until crust is golden brown and cheese is bubbling. Things have been a bit up in the air here recently (explaining why I haven’t updated in over a week) and we both decided we needed a trip out. Undeterred by the torrential rain and armed with walking boots and umbrellas we headed to Melton Mowbray for the East Midlands Food Festival. Held in the ground of Brooksby Hall, a local agricultural college, 200 suppliers from around the region were there to sell their foodie wares. I have Phil @ Local Food Heroes to thank for making me aware of this event. I was pleasantly surprised with the variety and quality of producers with stalls there. My usual favourites Azorieblue and Farrington Oils were there but also some new found companies that I’m sure I’ll be returning to. The Leicestershire Handmade Cheese Co. was there with their Sparkenhoe Leicestershire Cheese. I adore this cheese and have tasted it before today. It is beautifully creamy and slightly nutty plus makes the ultimate cheese on toast! 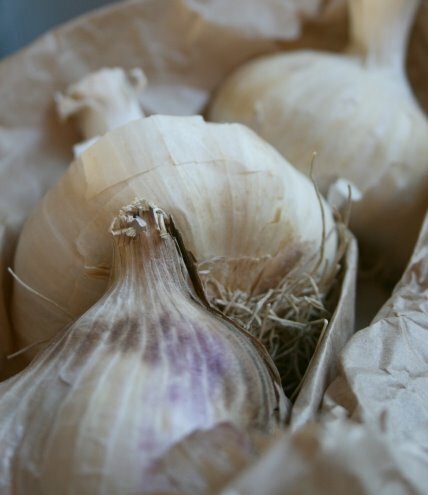 The garlic we planted this year didn’t work so I was glad to see The Garlic Farm there today selling garlic bulbs for planting. Crossed fingers they work this time. 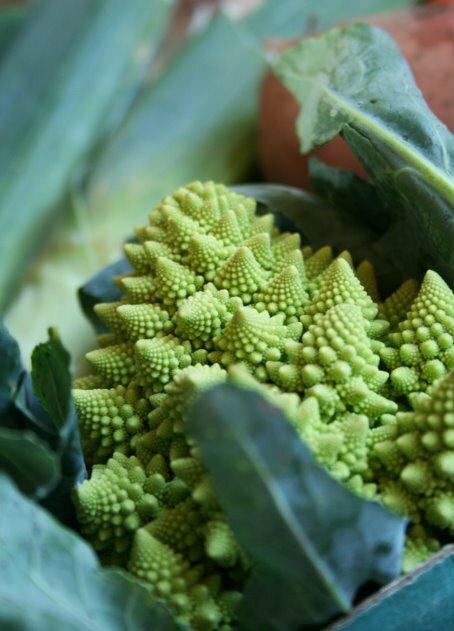 I was first drawn to the stall by the giant ornamental cabbages and Romanesco broccoli,I never thought I would ever get excited about vegetables! Woodlands Farm run a veg box scheme and although we live too far away from them to deliver we were able to buy some of the veg boxes today. The selection in the small box we bought was fantastic and fresh. Peppercorn Catering had a popular stall adorned in various cakes. 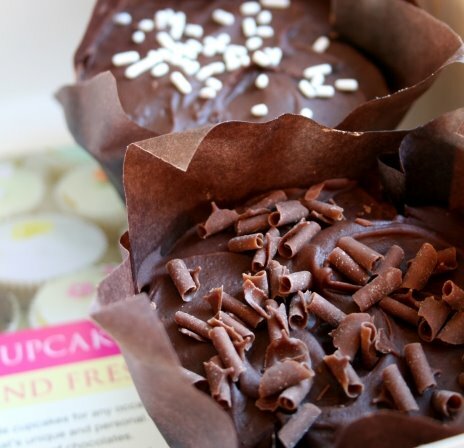 We picked up some of their delicious Chocolate Indulgence cupcakes. It’s also good to find a local company that delivers cupcakes. We also picked up some steak sausages from Blackbrook Longhorns that will be dinner tomorrow and Hubby went a bit mad on the Continental Cottage stall and we now could be eating various types of salami for months to come. For lunch we had some duck fat roast potatoes with soured cream, sea salt and parsley, the perfect antidote for a rather late, alcohol fueled Saturday night. My favourite supplier of the day certainly has to beChocolate Confetti What made them stand out from all the other chocolate stalls there was their range of unusual chocolates. I was truly spoilt for choice and wanted to try them all! 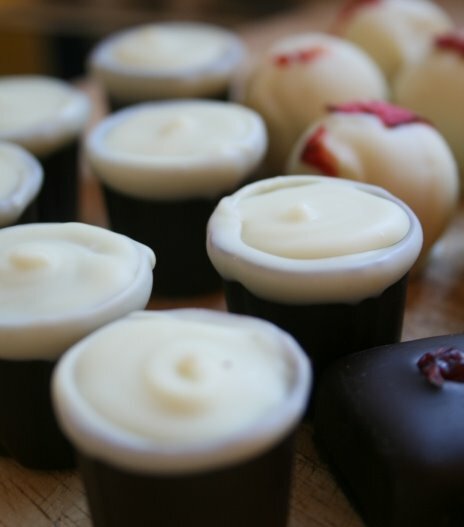 I eventually settled on Strawberry & Pimms white chocolate truffle, White Stilton & Port enrobed in dark chocolate and a Guinness chocolate. As soon as I saw the white Stilton & port chocolate I knew it had to be tried. You can certainly taste the saltiness of the Stilton paired the with the sweetness of the port and bitterness of the extremely dark chocolate. Although it may sound like a strange chocolate it was one I would certainly eat again. Thankfully (but unfortunately for my pocket) Chocolate Confetti have a stall at a Farmers Market local to me. We’ll certainly be returning to the East Midlands Food Festival next year.